The 15 gauge Pawa PG101 Glove provides you with excellent dexterity, even in oily environments. W..
Building on the foundations set by the PG101, the PG102 adds knuckle coating to its impressive list ..
Dual layer nitrile coated gloves. Primary layer provides liquid proof barrier, the secondary laye.. Durable cut resistant glove with dual layer nitrile. High performance anti-cut liner with a prima.. Fully coated dual dipping technology. Great water repellency and breathability. Technical f..
Ultra light 18 gauge anti-cut glove with second skin feel and high levels of dexterity. 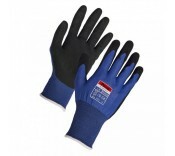 High l..
A highly durable cut resistant glove for demanding tasks. Grip, comfort, and dexterity in one cut..
A multi-fibre high performance cut resistant glove. Premium protection against cuts and abrasions..